Brinkburn Goat’s cheese is a pasteurised, semi soft cheese made with Vegetarian Rennet. The cheese was originally created as a special recipe for the Brinkburn Music Festival at Brinkburn Priory in 2000, as a variant of their already popular Elsdon Goats cheese. The variation in the production of this cheese is the three month maturation in cellar conditions, cultivating a deeper, richer flavour and it’s characteristic dusty, mould-ripening. Before it’s short spell in the fridge prior to heading down to the cellars, the cheese (after the curd has set) is stirred for a full minute, every ten minutes for an hour, moulded then left to rest for 18 hours before being dry salted. The cheese is the creation of Mark Robertson of the Northumberland Cheese Company and uses the milk of a Cumbrian farmer’s Swiss Saanen goats. Brinkburn has won an array of awards, all of which can be seen on their own site here, most recently 2nd place in the Great Yorkshire Show in 2013. 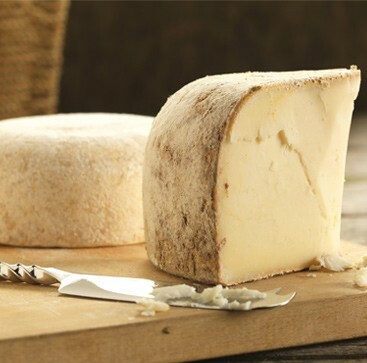 Brinkburn cheese is widely known as an enigma, being an elusive, almost contradictory cheese, because of it’s beautiful mix of tastes and textures. Crumbly yet moist, light textured and velvety, delicate and sophisticated yet full of flavour and embodying a clear tang and edge, with a slight hint of salt. Brinkburn is a cheese to entice even those who are sure they dislike Goat’s cheeses, a real surprise to the palate and perceptions. Due to the tantalising depth and complexity of the flavours this is one we would really recommend you enjoy pure and simple, unadulterated with either some fresh bloomer loaf or your crackers, oatcakes or crispbread of choice. The tastes and complexity does grow stronger the longer it matures too, so it might be worth trying it at different stages to get a full appreciation of Brinkburn.